My books are superversive in that they seek to build up the reader and bring light to him. They are the opposite of grimdark. Things might look bad during the course of the story, but there is always hope and they will end with the good guys winning if they choose well. Lou’s Bar & Grill came to me as the collision of several things. First, in high school, I started reading Alfred Hitchcock collections. They always had exactly one Faustian bargain within them. That’s a deal with the Devil. I wanted to read a whole collection of them but never could. This was in the dark ages before Internet. Secondly, I love The Twilight Zone. When I finally started writing these stories, I wanted them to have a Twilight Zone feel and placed them all in one a bar that shows up where a new customer might be. 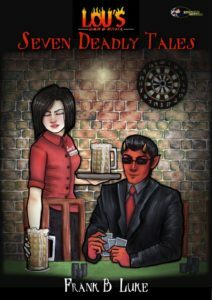 Basing a collection of deals with the Devil on the seven deadly sins just made sense. Fantasy has always been a thing for me. I love books about dragons and honorable knights. In junior high, I read through so much of the fantasy section at school, that the librarian actually ordered more books specifically because she knew I would like them. Those were the first three DragonLance Chronicles: Autumn Twilight, Winter Night, and Spring Dawning. I devoured them and read them again at least twice more in high school. We didn’t have a book store in town, so I re-read books I liked much more than I do now. Nyarlathotep laughed with an ugly sound like a wheeze. “It’s not the first relic I’ve taken. Joshua sends people after most of them, Richard.” He smiled horribly and pointed to a pile of human bones in the corner. “My name is Harold.” Harold struggled fruitlessly between the Mi-Go. “Why do you want the Book of Kells?” His writhing accomplished nothing except the Mi-Go tightening their grips. Chitinous spikes dug into his arms. Pizza with pineapples, yes or no? Depends on what other toppings. With ham, yes indeed. Pepperoni or beef, no way. A place were I used to work, I actually developed a reputation as the pizza guy. And if I could reopen any one pizzeria I’ve visited over the years that is now gone, it would be Ken’s Pizza Parlor. They only operated in Oklahoma and Texas, might even still be a few open somewhere out there. What was your second dog’s name? My second dog was my favorite dog. His name was Poncho. We had him for five or six years. He liked to chase my grandfather’s cows but never caught any of them. If you had a chance to co-write with any author, current or from the past, who would it be? I would love to cowrite with C. S. Lewis. One of the reviewers of REBIRTHS said of it, “If C.S. Lewis had played the Elder Scrolls before writing Narnia, it might have turned out like this.” I believe Narnia is the set of books I have read the most often. A little about your self (ie, your education, family life, etc.). I am a pastor, programmer, and seminary grad. The last is where I met my wife. She takes care of the kids while I earn money. I’m not sure which is harder, but I know which is more important. I just started a re-read of the Chronicles of Prydain. I last read it a few years ago with my sons. They liked the adventure of a young boy growing into manhood. It’s definitely a great series. The boy wanted to be a hero in the beginning but learned and grew until he was satisfied to just be a man. Then it was pointed out to him he had been acting like a hero for years by keeping his promises and protecting those in need. My family has DVDs of series that we enjoyed. We specifically chose not to have any kind of reception. My choices in that batch are ST: Original Series, ST:Deep Space Nine (all seven seasons). My wife has LITTLE HOUSE ON THE PRAIRIE and WHEN CALLS THE HEART. We aren’t sure at all what’s going to happen to the last series since the main actress is in such hot water with the Feds (Lori Loughlin). I blog at frankluke.wordpress.com. I also have a Facebook page, but that is a personal not professional page. On my blog, you can sign up for a mailing list. Who’s Intolerant Bigots? You’ll Never Believe What Science Says!